Mi-GMIS is pleased to host bi-monthly Regional Roundtables. As with the roundtables at our annual conference; this format provides a venue for peer networking, problem solving and helpful, relevant, timely discussions about some of the challenges that we all face. 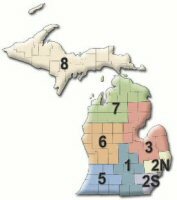 The Mi-GMIS regions will loosely correspond to the Michigan Emergency Management and Homeland Security Regions. In an effort to best meet the needs of our members, we anticipate planning the meetings to begin around lunchtime and end around 4 p.m. or so. Vendor meal and beverage sponsorship is appreciated, however events are only open to government members and prospective government members. Please register to help us properly plan for the event. Please visit our Event Calendar to register yourself and co-workers. Encourage your "neighbors" to join us as well!